Not much is happening with the 1947 Dodge these days. I’ve been working mornings and can’t easily get over to Joel’s to help him work on Josephine. Add to that, there’s that little problem of needing extra cash to move ahead with the Dodge project – and neither Joel nor I have had much extra cash as of late. Oh well. We’ll keep working on Josephine as we can! 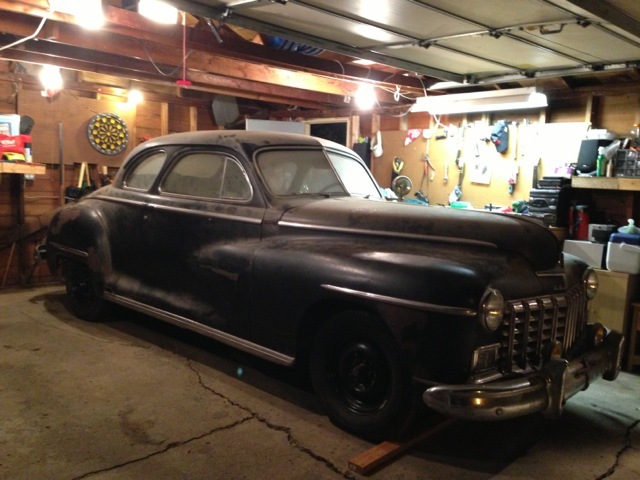 Over this last year (can you believe we started this wonderful 1947 Dodge project over a year ago already? ), there has been a lot of interest in our Dodge project. I have found myself talking about our Dodge project with all sorts of people – people at the coffee shop, at car shows, at the grocery store. I’ve met all sorts of great people and have heard their car stories in this past year and have shared our stories of Josephine. It’s been great fun! It seems that almost everyone loves old cars and Joel and I are more than happy to share stories and show pictures of Josephine with anyone who will listen. So in this past year I’ve found myself visiting our 1947 Dodge Blog website fairly often with the intent of showing a certain picture of the Dodge to a car lover – but I’ve discovered I can’t quickly find the picture I’m looking for. Well guess what? I I created a gallery of Dodge pictures on our new Pictures page so now many great pictures of Josephine are easy to find. To view the gallery, just click on the Pictures tab at the top of this page. It’s way up top on the right. Hi Josh. There’s no way I would have gotten as far along as I have without the help of the folks over at http://p15-d24.com/ I’d recommend visiting that page and signing up for the forum.